Valley Immediate Care is now providing a simple, affordable urgent care program for individuals and families. You’re covered for a convenient, low-cost, monthly membership fee. No Insurance. No Deductibles. No Worries. When seeking urgent care, Grants Pass, Medford, Ashland and the surrounding communities trust Valley Immediate Care. Now, we have developed a unique program to meet the medical needs of Rogue Valley residents with or without health insurance. Our new program “My Urgent Care 365” is not health insurance and will not be billed to your insurance or count toward deductibles. Instead, this simple, low-cost, monthly membership program allows you to visit any of our urgent care facilities when you need us, seven days a week, during our convenient hours. With My Urgent Care 365, you gain access to a set number of visits per year, plus 50% savings on all of our additional services such as x-rays, lab testing, etc. 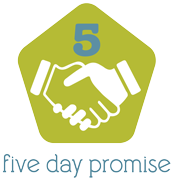 And as always, you are covered by our 5-Day Promise. Which Membership Plan Is Best For You? A one-time $20 membership fee applies for all member plans. *Every lab, x-ray and procedure we perform at Valley Immediate Care will be performed at half-price. Furthermore the 50% discount will apply to splinting, casting, laceration repair, foreign body removal, ear lavage, breathing treatments, in-house medications/injections and every other in-house diagnostic test or treatment. Sample of available services listed below. Requires Adobe Acrobat. Click here to download. Is my “Urgent Care 365” health insurance? This is not health insurance and does not replace health insurance. No insurance will be billed, and your visit will not be counted toward any deductibles. This is a plan that allows you to have access to all Valley Immediate Care facilities, gain access to all of our services, and receive a 50% discount on those services. All Health Savings Account (HSA) plans can be used for the minimal facility fee as well as any urgent care services required. Will my visit apply to my health insurance deductible? No. This is not insurance and will not be billed to insurance or apply to any deductibles. Can I have my family use this membership plan? Yes. My Urgent Care 365 membership is available to individuals and families. You can sign up and add up to 4 family members. A family plan allows for up to 5 visits per year. Your membership starts the day you sign up for a one year period. You can renew every year and enjoy the benefits of the program. Automatic monthly payments will be billed to the debit or credit card you provide at the time of sign-up. The automatic deduction occurs once a month and can be reviewed on your individual bank statement. Yes. If you use the membership program for a visit, you are responsible for payment of six months of service. You may continue to use the program for that six-month time period or simply pay the six months and discontinue the service. If you have never used the service, you may cancel any time and will not be billed for any additional monthly membership payments. Why did you start this membership program? We know health insurance is expensive and sometimes does not cover the costs incurred when you become sick and/or injured. This affordable program helps individuals get the urgent care they need at a very fair and affordable price. If you visit us for any reason, and within five days, you do not feel better, we welcome you back for a follow-up visit at no charge. The follow-up visit won’t even count against your membership plan! Any additional services will be charged, but you will receive the 50% discount on all services required. No. You can simply show your identification at time of service and indicate that you are a My Urgent Care 365 member. We will have record of your sign-up, and you will be billed accordingly. Do I save money with this membership program? In most cases, this program saves you money and provides maximum flexibility. However, this largely depends on the type of insurance that you have and the annual deductible. Our staff will make sure to share your options. May I cancel and sign up again later? Yes, however, you are subject to our cancelation policy and a new application fee will apply. This is a nominal fee used to cover basic administrative costs associated with patient processing. This fee is charged for every visit to Valley Immediate Care. The exception is our 5-day Promise; follow-up visits do not incur this fee. This is the one-time fee we charge to process your application for our membership program. When should I to go to Urgent Care? It's important to understand when you should go to an urgent care center. These facilities are not appropriate for life-threatening illnesses or injuries. If, for example, you have a cut that is extremely deep and will not stop bleeding, an emergency room may be a better option than the urgent care. Even if your injuries are listed as the most commonly treated, in more severe cases, you may be transported to a local emergency room. Urgent care facilities are a good option if, for example, you are unable to get to a primary care physician during their regular office hours. Urgent Care facilities are also not an appropriate place to manage chronic illness such as diabetes, hypertension, COPD, congestive heart failure, depression or chronic pain. If you have a chronic illness, an urgent care physician may or may not be able to treat you, but will certainly be able to refer you to a primary care provider or an appropriate specialist. Note: This is not an insurance plan and does not replace your insurance plan. Insurance will not be billed or claims filed. Individual members will pay all medical services when services are rendered. Monthly membership is automatically billed through debit or credit card. only the limited scope of primary care services specified in the retainer medical agreement.